I highly recommend the place! The service is exceptional! The staff is hospitable and always available for any kind of information or help needed! It’s very clean and the accommodation and interior is well arranged, modern and welcoming. The view from the large terrace with the swimming pool is stunning. Finally it is a perfect place for a couple and if you are looking for peace and quiet! It was stunningly beautiful and property manager, owners, maids, etc. went out of their way to make sure we were happy! Exactly what we were looking for our honeymoon!!! The location it is quiet, very private, the neighbors did not have view to our room or pool, it is 2 min away from the stone park, close by the blue caves and 20 min away from the shipwreck by car. 45 min from the city... it’s better to rent a car to go there. Staff were very friendly Mr. Angelos & Ms.Linda were very kind... it was our honeymoon and they prepared our room each time with a new design on the bed. At check in a basket with local products was offered to us. The greenery and the placement of villas in space give a perfect privat atmosphere. The location was excellent and just a short stroll to St Nicholas Port. There were a number of great restaurants located between Emerald Villas and the Port, all of which had amazing views and lovely food. The villa itself had a great sea view, the swimming pool was lovely and the facilities were great. The villa itself was cleaned regularly by the staff who were very helpful and dealt with any requests we made quickly. I would recommend hiring a car for your stay as there are some great beaches in the surrounding area to explore. Our private villa was absolutely gorgeous. Private pool, sun bed, all facing east overlooking the ocean high on the mountain side. Northern end of the island very close to Shipwreck beach and Blue cave launch sites. The bathroom/shower was THE BEST. Rain type shower head, excellent water pressure and hot water. The kitchen area was very nice. Standard refrigerator, dishes, utensils, water boiler for beverages, toaster oven, stove top, and oven. The east facing wall was two, huge, floor to ceiling, sliding, glass, doors. Very new. Absolutely EVERYTHING! THE COMFORT, THE VIEW, FABULOUS STAFF, ASSISTANCE WHEN NEEDED, FRIENDLINESS. GOING THE EXTRA MILE... EVEN WHEN THE DON'T NEED TO. THESE PEOPLE KNOW WHAT GOOD CUSTOMER SERVICE IS!!!! THIS IS A 7STAR FACILITY! WILL 4SURE GO BACK AGAIN!!! AND THEY ARE SO FAIR PRICED. THEY MAKE IS POSSIBLE TO ENJOY THEIR BEATIFUL ISLAND IN LUXURY! AGGELOS IS THE PERFECT HOST AND HAS A HEART FOR PEOPLE. LINDA LOOKED AFTER OUR VILLA WITH SO MUCH CARE. WELL DONE TO AN AWESOME TEAM AT EMERALD VILLAS!!! We liked the location, the team. all is done with love. the facilities are beutiful and the pool and view great. Kitchen well equipped. Lock in a great price for Emerald Villas – rated 9.7 by recent guests! 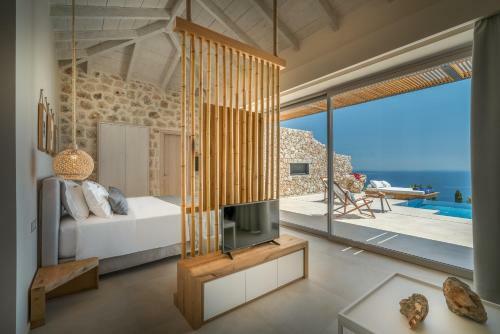 One of our top picks in Agios Nikolaos.Within 1,000 feet from Agios Nikolaos Beach, Emerald offers luxurious villas with private swimming pools enjoying panoramic views over the Ionian Sea. The stone-built villas include a fully equipped kitchen and provide free Wi-Fi throughout. Emerald Villas are decorated with respect to the local style featuring wooden furnishings and earthy colors. They consist of a living room, dining area and private bathroom with spa bath. Other facilities include a flat-screen, satellite TV, DVD player and a Play Station game console. The swimming pool area is surrounded by a stone-paved sun terrace with wooden sun loungers and umbrellas. It also features an outdoor dining area, where guests can enjoy al fresco dining, as well as relaxing hammocks and BBQ facilities. The port of Agios Nikolaos connecting to the island of Kefalonia is 1,000 feet away. The main town and port of Zakynthos is at 19 mi. Free private, on-site parking is provided. When would you like to stay at Emerald Villas? This villa features a balcony, toaster and kitchenware. This suite has a balcony, air conditioning and oven. This suite features a balcony, stovetop and private entrance. Το Emerald Villas είναι η απόλυτη επιλογή για όσους επιθυμούν να περάσουν τις διακοπές τους στην Ζάκυνθο. Βρίσκεται σε μια από τις πιο ήσυχες και όμορφες περιοχές του νησιού που μπορεί να προσφέρει τόσο την γαλήνη σε κάποιον που θέλει να αποτραβηχτεί και να ηρεμήσει όσο και τις ανάλογες παροχές και δραστηριότητες για όσους το θελήσουν. Οι βίλες του συγκροτήματος προσφέρουν την απόλυτη απομόνωση στους πελάτες που επιθυμούν διακριτικότητα και ταυτόχρονα βρίσκεται σε πολύ κοντινή απόσταση από το κέντρο του οικισμού και την παραλία. Επιπλέον οι σύγχρονες παροχές των καταλυμάτων οι οποίες και βελτιώνονται χρόνο με το χρόνο βρίσκονται σε ένα επίπεδο που σίγουρα θα ικανοποιήσει και τον πιο απαιτητικό πελάτη. Η διεύθυνση και το προσωπικό των Emerald Villas είναι καθημερινά στο συγκρότημα πάντα σε ετοιμότητα να εξυπηρετήσει ή να βοηθήσει σε όποια επιθυμία των πελάτων μας. Μετά από μακροχρόνια απασχόληση στον τομέα του τουρισμού και την παροχή διαμονής στην Ζάκυνθο είχαμε αποκτήσει τα εφόδια και τις γνώσεις να προχωρήσουμε στην δημιουργία των Emerald Villas, ενός συγκροτήματος βιλών, όπου θα πρόσφερε το ιδανικό κατάλυμα σε μεμονωμένους πελάτες που αναζητούν το κάτι παραπάνω στην διαμονή τους. Το Emerald Villas είναι η απόλυτη επιλογή για όσους επιθυμούν να περάσουν τις διακοπές τους στην Ζάκυνθο. Βρίσκεται σε μια από τις πιο ήσυχες και όμορφες περιοχές του νησιού που μπορεί να προσφέρει τόσο την γαλήνη σε κάποιον που θέλει να αποτραβηχτεί και να ηρεμήσει όσο και τις ανάλογες παροχές και δραστηριότητες για όσους το θελήσουν. House Rules Emerald Villas takes special requests – add in the next step! Emerald Villas accepts these cards and reserves the right to temporarily hold an amount prior to arrival. Please inform Emerald Villas of your expected arrival time in advance. You can use the Special Requests box when booking, or contact the property directly using the contact details in your confirmation. Comfortable, cozy, clean. Nice view. Privacy. Honestly if someone is unhappy with this place... there is seriously something wrong with that person. 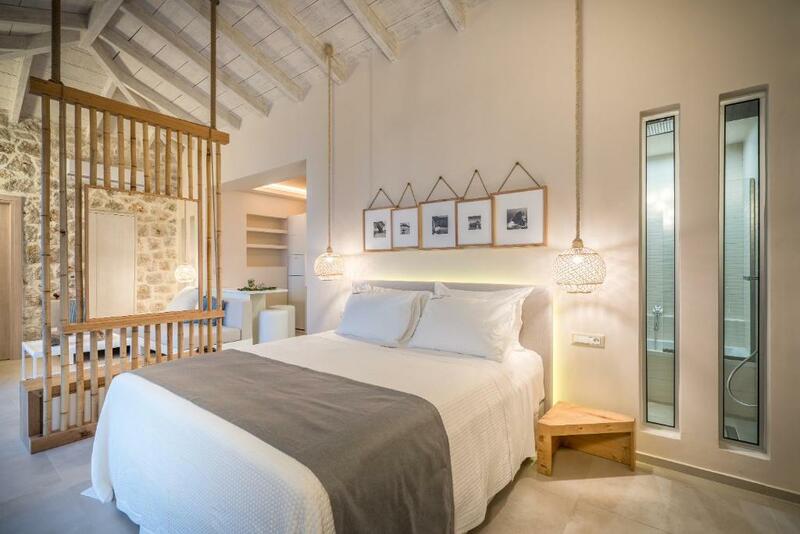 This gorgeous 2 bedroom villa with a private pool and a spacious chill zone overlooking wonderful sea scenery is a perfect place for anyone who wants to enjoy a memorable stay in Zakyntos. The staff is very friendly and polite. Parking space is available, powerful broadband connection and lots of restaurants around is a big plus. The only disadvantage for us was that to get to the nearest beach with a toddler was possible only by car. (Tip for future guest – you will fully enjoy your stay when you have a rental car.) Thank you very much guys, we had a really pleasant stay! No bar on the property but it is being built already! Host was no help and rude, I mentioned to them that I had a death in my family which caused me to leave early and lose out on three days in the villa so host said if booking.com were alright she would refund me the money then calls back to say that they couldn’t do anything to help.....so I called booking.com myself and they said the complete opposite which really disappointed me as I felt that it was only fair that I get my money back, they are a bunch of liars and I don’t recommend there services at all. The layout and decor is tastefully done to suit the beautiful surroundings, the view is incredible. The hosts, Violet and Angelos, are both kind and helpful people. They know the exact balance of giving peace and quiet but are always there to help when you need. I would definitely come here again, fantastic value for money!